Boasting a massive and diverse cast of everyone from Party of Five's Jeremy London to Pulitzer-winner-by-blood Malachy McCourt, Gods and Generals, the prequel to the TNT film Gettysburg, was made with a theatrical release as its specific intention. 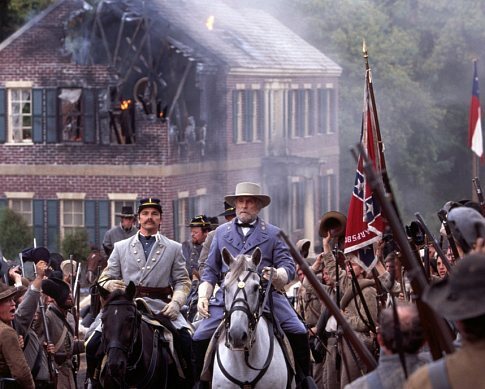 Covering four major battles of the Civil War and based on the book of the same title by Jeff Shaara, Gods and Generals has 157 speaking roles. The February 21st 2003 weekend brought four openers, and two of them were very big misses. One of those flops was Ted Turner's Gods and Generals, the 231 minute epic (it felt longer) about the American Civil War. The film was financed by Ted Turner and cost the ex-CNN cheif a higher-than-originally-thought $60 million. The film was distributed by Warner Brothers, but it would have been Ted who felt the financial pinch on this one. The film's length kept the venue count low at only 1,533, so Ted was going to have to hope for word of mouth for his pricey pic. Turner even went so far to tell the Atlanta Journal-Constitution: "I'm a movie man. ... It's very important that [Gods and Generals] do well and be critically acclaimed because I'm playing for the history books. I'm writing the final chapters of the Ted Turner story." I almost feel sorry for the guy. Almost. Gods opened to only $4.7 million over its three-day opening frame, finding a lame screen average of $3,050. Reviews were horrid. Of the 102 reviews counted at RottenTomatoes, only a lonely 9 were positive, leading to a rotten rating of 9%. 9%. Nasty. Post opening weekend, the film's fortunes did not improve, in fact they got nastier. Gods didn't expand its screen count over its second weekend, and the film dropped 37%. After that, Gods and Generals had consecutive weekend drops of 54%, and was pretty much finished at that point. Gods and Generals grossed only $12.9 million, a loss of about $45 million for Ted. The DVD for Gods has just been released. So Ted, we at BOP hope that you can make a bundle off DVD sales, and recoup some of your heavy losses. This is a case of a man doing what he loves, and failing miserably at it.